DNA and Pyrogens. Sterilization is done through an Electronic Beam Process that does not alter the color or make the plastic brittle. Molded with ultra-high molecular weight polyethylene, the filters are completely inert and consistent in porosity. This insures that the BioPointe filters will not impede airflow and will protect samples and pipettor from harmful contamination. Because BioPointe manufactures its filters in a clean-room facility, every component is free of detrimental nucleic acid and enzymes. BioPointe Scientific uses the highest quality plastics and best manufacturing practices to consistently produce a superior product. With its thin-wall design, the Super Seal achieves a great fit and more accurate aliquots during research. The soft, flexible material makes BioPointe tips easy to insert and eject, thus reducing the risk of repetitive work disorders. There is simply no comparison to the Super Seal of a BioPointe tip. 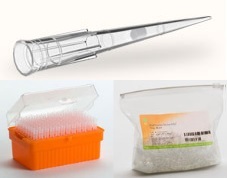 Developed to achieve exact pipetting, all of BioPointe’s tips feature the innovative, Precise Pointe technology. The thin-wall design uses a minimal amount of plastic resulting in the lowest possible surface tension. With an ultra-fine tip, the Precise Pointe allows access to the bottom of a vessel with accuracy, and insures total retrieval of a sample. BioPointe Scientific also manufactures the BioPointe Total Defense™ Superior-ART™ Tips . The ART Aerosol Resistant Filtered Tips offer the ultimate in sample protection, sample retrieval and contamination prevention. From the original inventor of the ART tips comes the newly redesigned Superior-ART™ Tips that offer total defense against contamination and cross-over and maximum dispensing of samples. Rose also offers the entire premium range of tips manufactured in Germany by AHN Biotechnologie, presented on separate pages, as well as Rose Scientific’s own Rose Brand. Rose Scientific strives to provide complete liquid handling solutions to our customer so we urge you to contact us if you cannot find a suitable product for your needs. Inquire about volume pricing and long term contract supply.